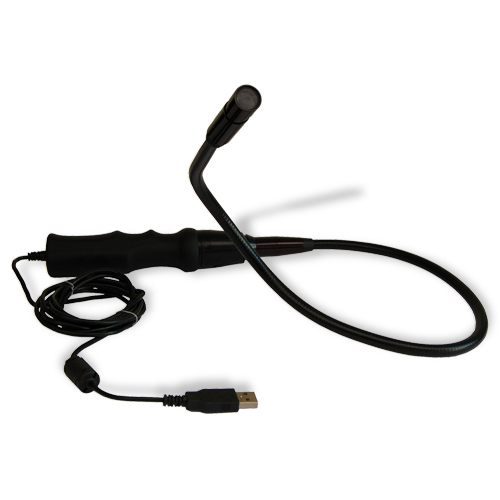 The Snakescope from ThumbsUp is a camera with a light on the end of a bendy stick. And that is exactly as much fun as it sounds ie – LOTS of fun. It’s powered by USB and shows up the footage from its camera on your computer screen. You can record it, take pictures or just watch it live on-screen as you poke Snakescope into a hole somewhere. Yes – it does look like those endoscope cameras that doctors in science programmes stick into the orifices of people with intestine problems. But though it says it is “perfect for peering into those hard to reach places” it is NOT for internal use. We certainly didn’t put it in our mouths and look at our molar. They also suggest using it to periscope around walls, or over walls. Though we’re not responsible for any social issues that arise from you doing that. The camera resolution on the Snakescope is surprisingly great (640×450 VGA)- though you need to hold the head quite still, which can be difficult. The light works very well and it’s tough enough to poke it around. The USB connection means that you don’t need batteries and the footage just pops up on the screen: nice and simple with no bits to lose. The downside of course is that you can only be at furthest 2m away from a computer – the length of the USB cable. The bendy neck is then 60cm long, fully extended. It comes with a installation CD – unfortunately in mini-CD format – a format we don’t like. However, it’s pretty straightforward to set-up. Oh and you can take stills, which is nice. If you need to poke a bendy camera into stuff, this Snake Scope is a nice choice. NB: Only works with PC, not Mac. This snakescope seems fun. I have one with flexible wire. It quite useful for me to check the engine.